SSC has released SSC GD Constable 2018 Notification 2018 on 21st July 2018 in employment news paper. Online Application Form for SSC GD 2018 Exam will start from 21st July 2018 on the Official website of SSC . Candidates will be selected to multiple posts as Constables in BSF, CISF, CRPF etc. SSC GD 2018 will be conducted to recruit eligible candidates to the post of General Duty. Staff Selection Commission will organize exam for the engagement of candidates as Constable (General duty) in BSF, CISF, ITBP, CRPF and SSB and Rifleman (General Duty). This Organisation has released a huge number of vacancy in the department of Central Armed Police Force (CAPF). 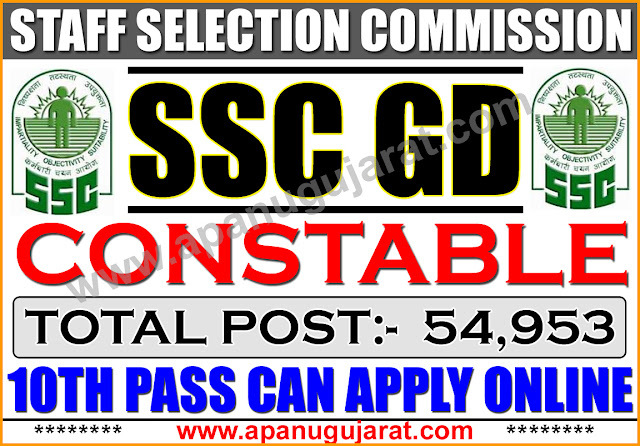 The total number of vacancies are 54953 vacancies, which are to be filled through SSC GD 2018 Exam. A candidate must pay an application fee of Rs. 100/- for SSC GD 2018 Exam. Candidates belonging toSC/ST/PWD category are exempted from paying the online application fee. Candidates can pay fee either online through Net Banking/Credit Card/Debit Card or through offline mode by generating a challan for the same. The Computer-Based Exam will be of 100 marks. The time of 90 minutes will be given to the candidates. There will be four sections in the examination- GK , Reasoning , Mathematics and English/Hindi. The candidates must have passed 10th class or equivalent from a recognized board.